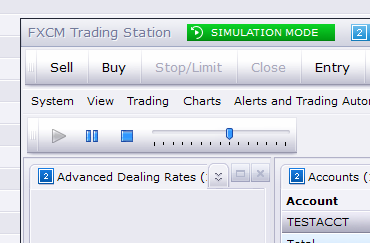 In my defense, Simulation Mode is a fairly new feature on Trading Station Desktop. you can now skip entire candles in Simulation Mode! It’s simply a matter of hitting the right arrow key on your keyboard. Hi Jason, when I press the right arrow key on my keybord in simulation mode, all it does it scroll the chart window. Step forward or backwards a candle at a time. I dont feel like watching a candle complete tick by tick, sometimes I just want to move through a sequence by having each candle appear. Is there any news on skipping a day per time in simulation mode? I think a lot of us would really appreciate that as for traders on the daily timeframe it takes way too long for the new candle to form at the moment. Just like GoodspeedF2, Grantx and jurjenbalster I have the same issue atm with the simulator. It would be super useful for backtesting my trading style but without stepping forward one bar each time it is useless for now. Waiting for the daily bar to close takes quite some time. Just a ‘next bar’ ‘previous bar’ option would make it great! Skipping candles one at a time would be a fantastic edition to the Simulator to make it able for me to use. It is currently the only reason i can’t use the program. I miss too many entries and it’s very very frustrating. I only learned this today, when I followed up with our developers again regarding your earlier requests for this functionality. I apologize but there has been some confusion on my part and on the part of our developers. I followed up with our developers again based on Grantx’s most recent feedback, and apparently they misunderstood what I meant when I told them of your request to skip candles. They thought you simply wanted to scroll left and right to view candles which have already been drawn. To clarify, there currently is no way for you to skip entire candles before they have been drawn in Simulation Mode. The good news is that I have now clarified the details of your feature request for our developers and they are considering it for a future update to Trading Station Desktop. This message is for US clients ONLY: NFA is temporarily increasing margin requirements on GBP pairs to 5% effective 5:00PM EST on Monday, November 7. To provide some additional background on my previous post, this ruling was issued last Friday by the NFA which regulates forex trading in the US. We were notified ourselves only that afternoon which is why I shared this information on the forum as soon as I could. NFA Financial Requirements Section 12 requires FDMs to collect and maintain a minimum security deposit of 2% of the notional value of transactions in 10 listed major foreign currencies and 5% of the notional value of other transactions. Importantly, Section 12 also permits NFA’s Executive Committee to increase these requirements under extraordinary market conditions. Given the recent events involving the U.K. exiting the European Union (Brexit) the Executive Committee has determined to increase the minimum security deposits required to be collected and maintained by FDMs under Section 12 for currency pairs involving the [B]British pound to a minimum of 5%[/B]. This increase is effective as of [B]5 p.m. (CST) on November 7, 2016[/B] and remains in effect until further notice. FDMs are also reminded that the Executive Committee raised the minimum security deposit required to be collected and maintained under Section 12 for currency pairs involving the Mexican peso to a minimum of 6% in January 2015. Given the recent volatility surrounding the Mexican peso, each FDM must ensure that it continues to adhere to this increased security deposit amount. Please note there is a [B]holiday in the US on Thursday, November 24th for Thanksgiving[/B]. 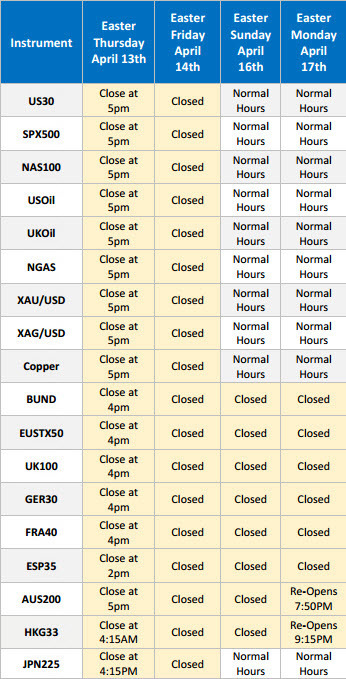 Forex trading hours remain unchanged, and you can see our holiday trading hours for CFD’s here: What are the CFD Holiday Hours? Please note there is a holiday in the US on Thursday, November 24th for Thanksgiving. 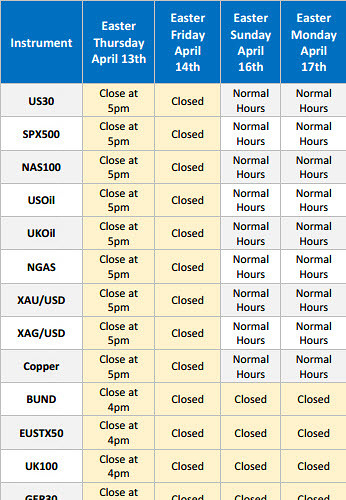 Forex trading hours remain unchanged, and you can see our holiday trading hours for CFD’s here: What are the CFD Holiday Hours? To my fellow traders in the US celebrating Thanksgiving, I wish you happy one! [/li]These increases become effective, for both new and existing positions, at [B]5 p.m. (CST) on December 5, 2016[/B] and remain in effect until further notice. Given the recent margin decreases that CME and ICE have implemented with respect to foreign currency futures involving the Swiss franc, the Executive Committee has also determined to reduce the minimum security deposit required for currency pairs involving the [B]Swiss franc to 3%[/B] (from the current 5% requirement imposed in January 2015). The decrease becomes effective at [B]5 p.m. (CST) on December 5, 2016[/B] and remains in effect until further notice. In order to comply with the NFA notice, FXCM US is raising margin requirements on MXN, JPY, and NZD pairs at approximately 5:00pm EST on Monday, December 5, 2016. FXCM US will also be decreasing margin requirements on CHF to 3% from the current 5% requirement imposed in January 2015. Again, this NFA notice applies only to the US, so margin requirements for accounts with FXCM UK and FXCM Australia are not affected. We urge all clients to proceed cautiously as market moves may be large and unpredictable. Up-to-date margin requirements (per 1K lot) are displayed in the Simplified Dealing Rates window of Trading Station. Remember that forex trading can result in losses that could exceed your deposited funds and therefore may not be suitable for everyone, so please ensure that you fully understand the high level of risk involved. I like the simulation mode. There is an issue with the 4 hour chart…The 4 hour chart in the Simulation mode displays the candlestick bars in 0,4,8,12,16,20 blocks. The real account 4 hour chart displays the the candlestick bars in 1,5,9,13,17,21 time blocks. Is there a setting that can be changed for the Simulation mode 4 hour chart to display candlesticks in the same time blocks as that of the real account? Candle stick patterns are different due to the difference in time blocks. Use of simulation mode to practice 4 hour strategies is a problem. Welcome to the forum, Swingslide, and thanks for bringing this issue to our attention. Our developers are currently investigating, and I will update you when I have more details from them. When you open your Trade Station you will get the Login window. Press “Cancel”. (Simulation mode can be used even during the weekend maintenance times). Then the Simulation Mode parameters input box opens and you work through that selecting the parameters that you want to use. Finally press “Start”. Welcome to the forum, Etwanm! I see Manxx posted information for you while I was out of the office. Below are the CFD holiday trading hours for Good Friday and Easter. Forex trading hours remain unchanged. Please note all times are New York EST.